Since ancient times architects have used creative ideas to hide a building’s drainage system. In Greece and Rome, rainwater was channeled from temple roofs and expelled through the mouths of carved lion heads. The basic idea was the same as it is today; manage the rainwater and get it away from the building’s foundation. Modern gutter systems work well but are often unsightly. They can, however, be hidden from view. Hide rain gutters by blending them into a building's architecture. Make your gutters disappear into their background by painting them the same color as your house or the fascia located behind them. This technique is so effective, it’s often suggested by architectural review boards in historic communities. According to the Salem Historical Commission in Massachusetts, sensitive painting can do much to hide gutters and downspouts. Gutters come in a variety of shapes and styles. According to the book “Renovation 3rd Edition,” the two most common gutter profiles are the half-round and the more angular K-style. Choosing a gutter shape that coordinates with your home’s architectural style, and any decorative molding will make your gutters less noticeable. Radius gutters are available for use around curved architectural structures like turrets. Using radius gutters on curved structures is more unobtrusive much more effective than trying to construct a curved gutter from small, straight segments. One way to make gutters appear to blend into a home is to choose an appropriate material for their construction. Think about matching the gutter construction material to your home’s siding or fascia. Most gutters today are made of galvanized steel, aluminum and vinyl. 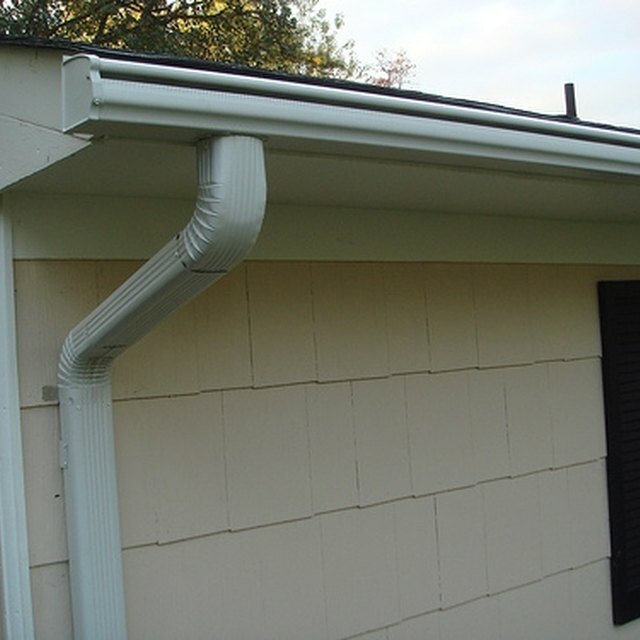 These gutters will not stand out against the backdrop of most aluminum or vinyl-sided homes. If you live in a historic or older home, you might consider undertaking the additional work involved with maintaining wooden gutters or the additional expense of installing copper ones. Wooden and copper gutters will complement an older home’s architecture, as these materials were traditionally used to collect and expel rainwater away from old homes. A more drastic solution to hiding unsightly gutters is to remove them from the roof line and install a drainage system in the ground, around the home. Tom Silva, of This Old House, prefers traditional roof line gutters and downspouts. Yet he acknowledges underground drainage can work. According to Silva, roof runoff falling directly to the ground should be collected by a drainpipe wrapped with filter fabric, and buried in a trench filled with pea stone. The trench should be lined with a heavy, black plastic sheet. Silva says the pea stone should remain uncovered by sod and extend at least a foot beyond either side of the drip line. Cost Helper: Gutters Cost: How Much Do Gutters Cost?